Organization at school or home is important. 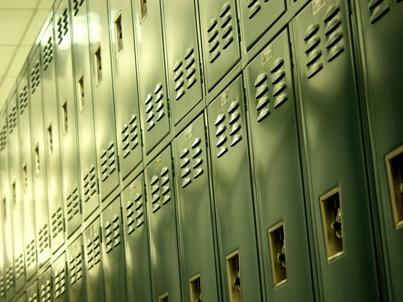 Locker organizers are a great way to ensure you get where you need to be on time. Rather than stuffing items into a locker helter-skelter, or having the contents fall out when the door is opened, organizers make it possible to grab just what you need and be on your way. Some organizers are made of plastic and stand inside your locker to add shelf space. Others are made of canvas, denim, or other fabric and hang inside your locker. Which one you choose should depend on your unique storage needs and preferences. You don't have to go far to find organizational help for your locker. Stores like Wal-mart and K-mart carry basic items, and a number of specialty stores offer items designed with specific locker needs in mind. Locker Dog is a website that specializes in locker organizing materials. They have a number of specialized organizers. Organize It makes locker organizing helps that hang in your locker and others that create shelving. These organizers provide shelves strong enough to hold notebooks, books, and other supplies and at the same time, frees up valuable locker space for backpacks and other essentials. Organize It has organizers that can installed several ways. Another option is to make your own organizer. If you're looking for ideas, several patterns and ideas can be found on the Internet. If you can use a sewing machine, or do crafts you can turn an old pair of jeans into a locker organizer, or make one from your favorite fabric. Recycled denim organizer is made from old jeans and embellished. This is a fun way to recycle old jeans as well as be more organized. Stars and Stripes locker organizer to sew. Back to School Craft ideas including and an organizer kids can make themselves. You can also use things you may all ready have in your home to create locker organizers. Instead of feeling frustrated because you can't find what you're looking for in a crowded locker, an organized locker lets you feel like you are in control of your life. Adding an organizer to your locker is a step toward living more efficiently. It not only saves time but it also makes life a little less stressful.